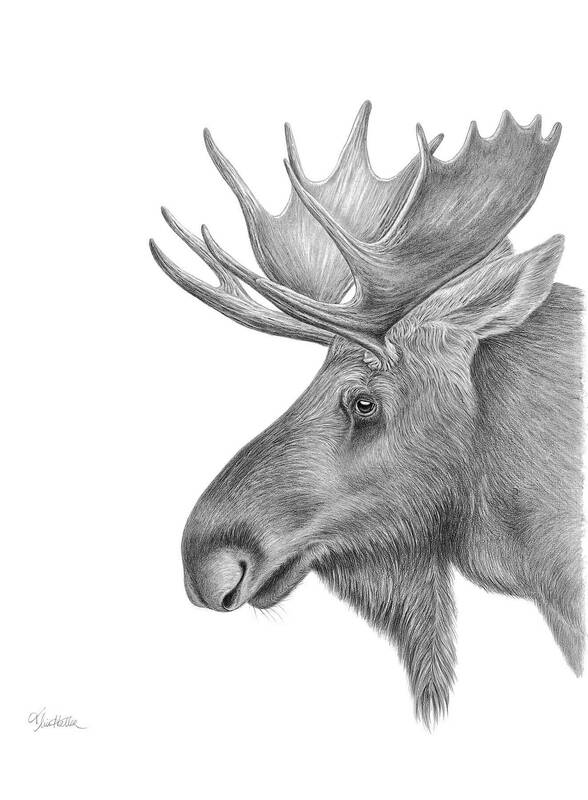 Moose Original Drawing- 22 x 30- Graphite on Paper. Welcome to the Pet Portrait and Family Tree shop of artist Tammy Liu-Haller. Commissions are open! To go back to my fine art page, click here. Moose Original Drawing- 22" x 30"- Graphite on Paper. This listing is for an original drawing created with graphite pencil on lovely Arches Rives BFK paper. Ships flat via Expedited shipping. Except for holiday times, when payment in full is required, a deposit must be made to commission a large, 14 x 17 tree. Upon completion of the item, I will mail photos to the buyer for their "approval". Upon acceptance, an invoice is generated via PayPal or Etsy and full payment is expected. Money is held in my account while I ship out the item. For all other items, including the 11" x 14" Commissioned Tree, payment in full is required when placing the order. My standard method of delivery is via 2-3 Day Priority Mail with Tracking. If a buyer is in a crunch for time, I can also use Priority Mail Express, which is guaranteed overnight delivery. Buyer is responsible for shipping fees. All sales are final. However, if there are any issues due to shipping damages, I will work with you to meet your satisfaction. Turnaround time depends upon the time of year. Late fall tends to be when orders come in quickly as shoppers think of giving a pet portrait as a holiday gift. I suggest placing your order over the late summer in order to get an early place in line.